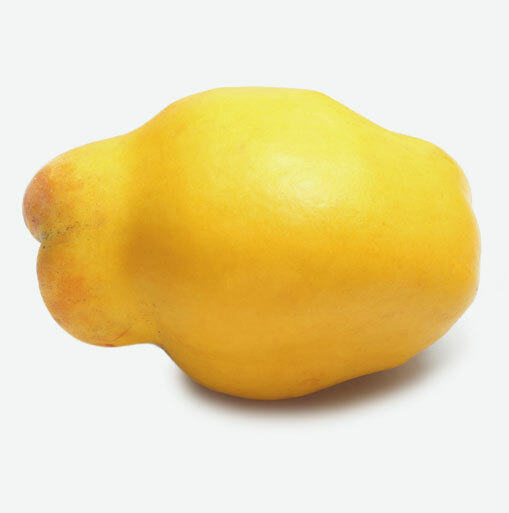 The small, yellow, quince fruit tastes like a cross between an apple and a pear. It is one of the earliest known fruits and were cultivated in Asia and the Mediterranean. Quinces are rarely used raw, and after cooking, their flesh becomes softer, sweeter and turns from white to pink in colour. • Low in calories, as low as 50 calories per fruit. • Source of Iron, Potassium and Copper. Choose quinces that are hard and firm. Sometimes quinces are mottled with brown spots, but these markings do not affect their flavour or quality. Once ripe, the colour of a quince will turn from green to yellow, but the fruit will still be firm. Store quinces in a plastic bag and refrigerate for up to a week. If quinces are not completely ripened, store them at room temperature until they are yellow all over and give off a pleasant scent. Be sure to store quinces apart from apples and pears because their powerful aroma may permeate these other fruits. Almost anything that can be done with apples can be done with quinces. They need a similar length of cooking time and are delicious stewed, baked, and made into jam or jelly. Peel quince before using it in jams, preserves, desserts, and savory dishes. Peeling works well with a vegetable peeler or a small paring knife. Remove the core with a small, firm paring knife. When baking with quinces, add sugar only after they become soft and the flesh starts to change in colour from white to pink.